The first local film production and distribution company to list on the Singapore Exchange - mm2 Asia - has a strong television and film background. Its founder and chief executive Melvin Ang has discovered the happy formula of producing home-grown movie hits such as Ah Boys To Men and hitting profit and loss targets. He enjoyed a storied career, first at the then Television Corporation of Singapore (TCS) in the late 1990s where he learnt TV production - from programming to sales. Mr Ang later joined MediaWorks, Singapore Press Holdings' now-defunct TV arm. In the early 2000s, he was back at MediaCorp, producing entertainment content. "When I joined TCS in 1996, they wanted someone who understood telecommunications and IT because of the advent of the World Wide Web. When that was launched, that's when you saw the convergence of telco, IT and content," he said. "After SPH, I was recruited back to MediaCorp, where I got into content creation, and tried to understand the limitations of the industry and market." His career at these places yielded lessons that make mm2 different from other players in the market. "If you are too creative and lack the commercial element, you can't justify the business. If you're too commercial and lack creativity, you can't create content that reaches the target market. So you need to find a balance," Mr Ang said. mm2 was founded in Kuala Lumpur in 2008 and began producing drama for Media Prima, Malaysia's media group. The firm later relocated its headquarters to Singapore and began making local TV drama, then moved into movie production for the Malaysia, Singapore and Taiwan markets. It also expanded into distribution and syndication. "Our goal is to produce content that can be consumed across various platforms. Today, everyone has a computer, tablet, iPad or mobile phone. Someone has to create and deliver that content, and we are in that space," Mr Ang said. But while digital content is easy to build, there is no clear monetising model. Most digital content remains free. So the only way to make money is by sharing advertising revenue with the likes of YouTube, or by producing branded content or stories for sponsors and going viral. But that is still not big enough to justify the investment, he said. To that end, Mr Ang has taken his company public. Proceeds from its initial public offering last year will be used for joint movie-production projects in Hong Kong, Taiwan and mainland China; working capital to beef up operations; and possible mergers and acquisitions (M&As). "If distribution needs to be beefed up in certain markets, we can forge an alliance with companies that can help jumpstart distribution there. The M&As will likely be with content-related producers or platform owners. These will help our bottom line." Asked why he chose to list in Singapore, he said he had considered Malaysia and Hong Kong. "But I felt that if you can't do well in your own home market, and try to do things in other markets, then it will be a taller order. "I'm confident because we are not just a local company. We're reaching out to the region; for a start - the Chinese-speaking market in Malaysia, Hong Kong, Taiwan and China. After that, we will move to the non-Chinese- speaking market." 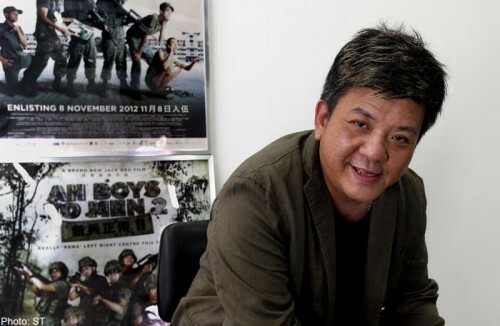 He outlined a two-pronged strategy: creating movies for individual markets such as Singapore, where Ah Boys To Men has been a hit, and Johor; and for Taiwan and the mainland. "We will also make transmarket movies, meaning movies that all markets can consume and understand, for instance, a war movie or a horror movie." Asked what he learnt from the poor showing of I Want You, a spin-off of the popular reality talent show, The Voice Of China, which opened in China in 2013, he said it was a "good lesson and made us more sure... of the next step". Made on a budget of 30 million yuan (S$6.4 million), it was backed by Mr Ang, director Chai Yee Wei and music producer Eric Ng. "We were given the chance to drive the production, so we had good financial control... We didn't feel we were cheated or bullied, but there were other competitive issues." China limits the number of foreign movies imported each year, and these are mostly Hollywood blockbusters. "It was also about timing, and judgment on whether a reality programme that's so popular can translate well into a movie. At the end of the day, it's about how to get back the money you invested. But, we are moving towards that."